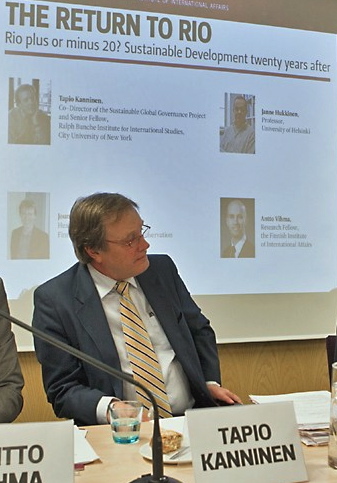 Tapio Kanninen is Senior Fellow and Co-Director of the Project on Sustainable Global Governance at the Ralph Bunche Institute for International Studies at the Graduate Center of The City University of New York. He was Chief of the Policy Planning Unit in the UN Department of Political Affairs (1998-2005) and Head of the Secretariat of Kofi Annan’s five Summits with Regional Organizations. Kanninen has worked on several UN reforms: as secretary and research focal point of the high-level drafting group of Boutros-Boutros Ghali’s An Agenda for Peace and convener of the interdepartmental task force to implement its recommendations; secretary of General Assembly Working Groups on An Agenda for Peace; of Strengthening of the UN System; and of Security Council reform. He also worked as a team member of the UNEP-funded project in the UN Statistical Office to develop a global framework for environmental statistics. Previous to an extensive international career, Kanninen worked at the Statistic’s Finland, a state statistic agency, and the Finnish Academy of Science and Letter. He was in charge of the preparations for the Finland’s first social indicator publication Living Conditions in Finland 1950-1975 and the second environmental statistics yearbook. Kanninen holds a M.A. in economics from the University of Helsinki and a Ph.D. in political science from the Graduate Center of The City University of New York. His Ph.D. dissertation was based on his work in Javier Perez de Cuellar’s Office on the UN financial crisis and reform and published as Leadership and Reform (1995) by Kluwer. He is also an author of Crisis of Global Sustainability (2013) by Routledge. In 2004, Kanninen was invited to join the prominent Club of Rome, the story of which is described in Kanninen’s new book. Would like just to point out that the book “Crisis of Global Sustainability” quotes “Hell and High Water: The Global Warming Solution” author as Joseph Fromm. The author´s name is Joseph Romm. A minor typo.